Blog Home > Decorating > Got a grotty fireplace? If you have a brick fireplace that is a bit of an eyesore, or maybe you just fancy sprucing it up a bit, we have two new projects on diydoctor which might be just what you need. 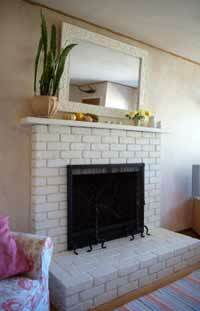 The first project is all about how to clean your brick fireplace, and covers several different methods you can use. It can be a messy job and can involve using quite strong chemicals, but as long as you protect the surrounding area in the room and are prepared to use a bit of elbow grease, the transformation is worth it. Now a good clean might be all the fireplace needs, but if you are wanting to paint it you should take a look at our new project on how to paint a brick fireplace. This gives step by step instructions on how to prepare, what types of paint are best to use and how to go about painting the brickwork. The results can be really worthwhile and change the whole feel of a room. So now you don’t have to put up with an embarassing fireplace anymore!